"Fractal � it is price behavior change. It means if fractal has appeared - price will change it direction. 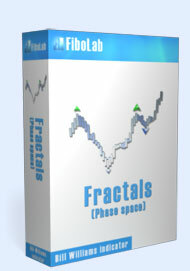 Fractal is a five bars sequence, where the central bar has higher maximum or lower minimum. The fractal arrow shows central bar position." On the image you can see default view of the BWI fractal indicator. Sell Fractals are shown as blue. Current (active) fractals shown by big arrows. 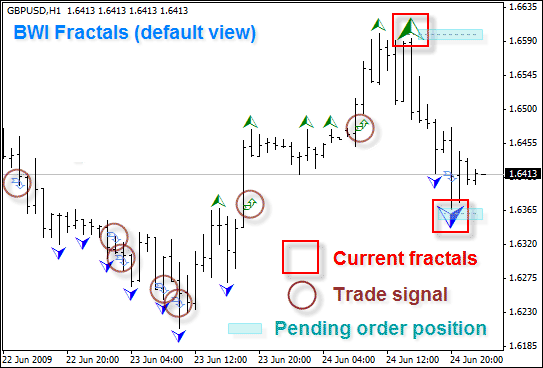 The Fractal is not a signal to open a deal on its own.Signal will appear when price go higher fractal’s maximum (or lower fractal’s minimum) on certain number of pips (in the original 1 pips). Once price go higher/lower � in breakout position will appear corresponding arrow. Appearance, colors, distance from fractal maximum/minimum (is used to show fractal breakout signal) and etc. 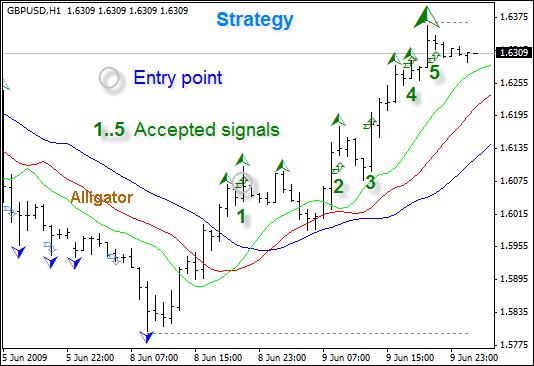 trader can adjust using properties of the indicator. "Our first signal entry into any market is always the first fractal outside the Alligator’s mouth. Once this signal is hit, we will take any and all signals that are triggered in that direction. If the buy signal is above the Red Balance Line (the Alligator’s Teeth), we would place a buy stop one tick above the high of the up fractal. If the sell signal is below the Red Balance Line, we would place a sell stop one tick below the low of the fractal sell signal. We would not take a fractal sell signal if, at the time it is hit, the price is above the Red Balance Line. This is the best method we have found to filter out nonprofitable fractal trades." All markets are characterized by the fact that on the most part the prices do not change too much, and only short periods of time (15�30 percent) account for trend changes. Most lucrative periods are usually the case when market prices change according to a certain trend. A Fractal is one of five indicators of Bill Williams� trading system, which allows to detect the bottom or the top. Fractal Technical Indicator it is a series of at least five successive bars, with the highest HIGH in the middle, and two lower HIGHs on both sides. The reversing set is a series of at least five successive bars, with the lowest LOW in the middle, and two higher LOWs on both sides, which correlates to the sell fractal. The fractals are have High and Low values and are indicated with the up and down arrows. The fractal needs to be filtrated with the use of Alligator. In other words, you should not close a buy transaction, if the fractal is lower than the Alligator�s Teeth, and you should not close a sell transaction, if the fractal is higher than the Alligator�s Teeth. 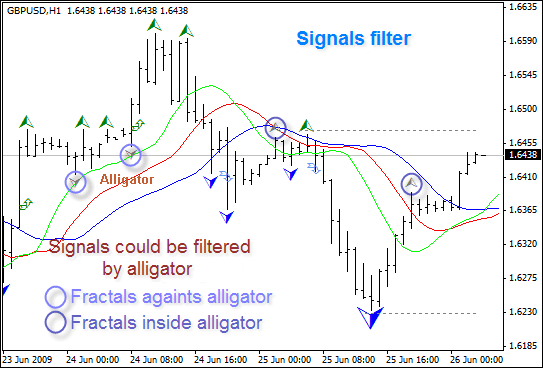 After the fractal signal has been created and is in force, which is determined by its position beyond the Alligator�s Mouth, it remains a signal until it gets attacked, or until a more recent fractal signal emerges.